Children learn at their own pace in our classes. They learn best through play in a fun, non-performance based atmosphere. We teach the children to think musically, making it so much easier when it comes time to introduce formal instrument lessons when they are a little older. 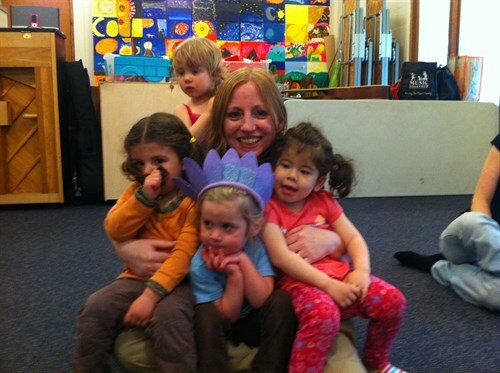 Our classes are all about participation from everyone in the room, especially the grown ups! "Hey, hey what do you say, let's all click our sticks today! During class we bring out many instruments, eg. Sticks, Eggs, Resonator bells, Scarves, etc encouraging the parents to model strongly for the children. 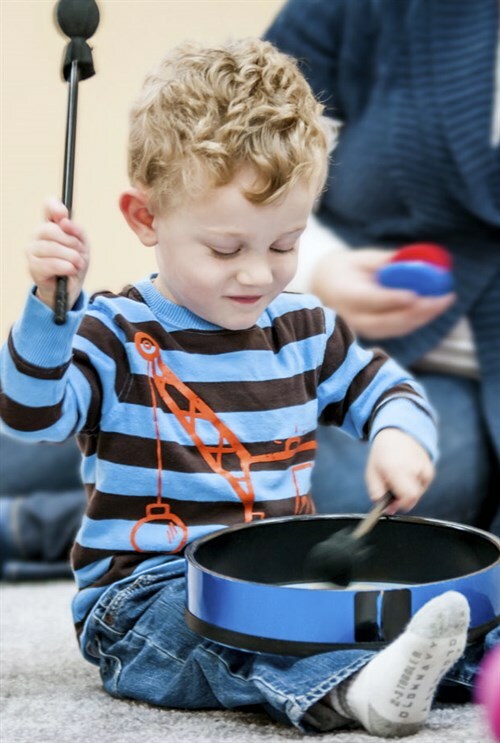 Children taking Music Together classes consistently for many semesters develop in the areas of speech, language, cognitive, emotional, motor and social skills. Not to mention the joy they get from singing, dancing, playing instruments and learning a vast repertoire of songs and chants. The best fun is yet to come, when they go home and make music with the whole family. Research has shown that the ideal time to introduce music is between the ages of newborn through 5, particularly babies through 3 years old being the most prime time. They are wired to receive so much at this age and everything is so much easier for them as these are the critical years in brain development. "Trot, Trot to Grandma's House". Grandparents, Aunts and Uncles, nannies, etc share this wonderful class experience with your child. After taking our classes for a few weeks, you will see how music is weaved into your daily life. Singing as you prepare dinner, bath time, getting the kids to clean up the toys. Parents share how they can't go to bed without singing a lullaby, and they hear their child singing "The Hello" song in the crib in the morning. And most recently families are delighted how they can share with other family members across the globe, through Skype (online phone video). They sing songs with Grandparents or Aunts & Uncles and their cousins. Music Together fosters "bringing music back into homes and the community". In our classes our families feel a special part of a community singing together. Our classes are mixed ages, babies, toddlers and preschoolers making this an extremely successful way for our children to learn. The younger children learn from the older children, and the older children receive many benefits of being the role model for the younger ones and learning important social skills. Parents and caregivers play a strong role in modeling movements for ALL the children in the room. The children learn from watching the adults and the other children in the room. So Sing loud and have fun with all the movements. Your child will soon be doing what you are doing either in class, or at home. I just had to share this photo that one of the mom's took in my Tues 5pm class. Sofia, Nina, Louise and Yael all sat on my lap during a particular song and out came the iPhone to take the priceless shot! !